It’s the same vitamin C the human body made internally many generations ago. Yes, vitamin C was once a hormone. Now you have to pay for it because your liver (like everybody else’s liver) has a mutation and no longer makes an enzyme required to convert blood sugar to ascorbic acid (vitamin C). So you can settle for eating six oranges a day (@60-milligrams per orange), which is the amount you need to live six years longer, according to a study published a few years ago. So let’s forget eating oranges, papaya’s, kiwi fruit, all day long. Oranges and papayas cost more than a vitamin C tablet these days, anyway. Only a few animals, like humans, don’t internally produce vitamin C, like guinea pigs, fruit bats, Japanese kill fish, and primate monkeys. The monkeys consume 6000-8000 milligrams of vitamin C a day. Us average modern humans just ~110 milligrams per day. That’s pathetic. But health authorities tell us 60-200 milligrams/day is sufficient to avert scurvy (bleeding gums, fatigue, anemia, painful joints, shortness of breath, lassitude (look up the definition), even if you smoke cigarettes, take diuretic water pills, take steroids or aspirin, all which deplete vitamin C). It was biochemist Irwin Stone who estimated humans once produced 1800-4000 milligrams of vitamin C per day, before the “great mutation” universally struck humanity. But there’s a catch. To maintain healthy blood levels up an avid vitamin C user needs to take 500 milligrams of vitamin C every 4-to-6 hours a day. So here is how to do that. 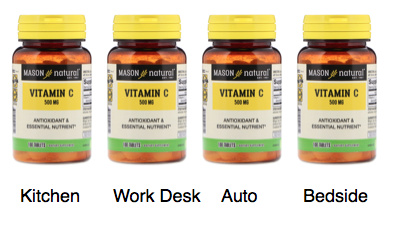 Buy 4 bottles of vitamin C tablets and place one bottle on the kitchen table, another bottle at work, one in your car and another on your bedside table. Now vitamin C tablets will be conveniently available. According to available data, it will cost you more in out-of-pocket healthcare expenses to NOT take vitamin C tablets. So the choice is yours. Most mammals are endogenously making vitamin C all day long. Because of that, animals don’t get heart attacks and don’t develop brain plaque, and a whole lot more maladies they never get. But that is enough. 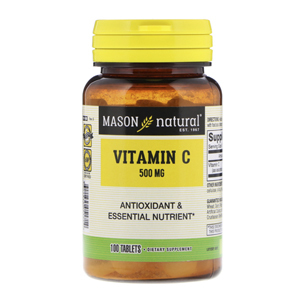 There are plenty of benefits that accrue from vitamin C supplementation. Start now, before you get any older. Make up for that gene mutation by taking vitamin C every day.